Great house in a beautiful location. Picture sitting on the deck with a coffee/cocktail while looking at the ocean and smelling the trees and water. Great location to explore Big Sur and Monterey Peninsula. Ocean views, spectacular sunsets, whispering pines—and a soaking tub with views of forever. Nestled in a half-acre forest in Carmel Highlands, this private cottage is a haven of natural beauty and tranquility. From the redwood deck overlooking the sea, you can hear the sound of the waves and the seals at Point Lobos. It's a short, pleasant walk to the Highlands Inn for lunch, dinner, drinks, live music or dancing. Hop in the car and it's a five minute drive to the Crossroads Shopping Center, and just a few minutes more to Carmel-by-the-Sea, Pebble Beach, Pacific Grove or Monterey. And, of course, you're also at the northern point of Big Sur with its wild wonders. So enjoy the best of many worlds! With vaulted ceilings, sun-filled rooms, a thoroughly modern kitchen, and an open floor plan with a fireplace, this lovely two bedroom home has everything you need for a relaxing vacation or a longer stay. One car garage, outdoor security camera, and plenty of extra parking. Nearby Activities: Hiking, golfing, surfing, cycling, theater/restaurants/concerts, fishing, birding, beach walks. Enjoyed our stay at this fabulous home away from home at Carmel Highlands. The house is very well equipped and is in a lovely area in the hills away from the highway but still within easy reach of the sea. There is a lovely decked balcony with loungers overlooking the sea and a fabulous double ended bath again with views over the sea. 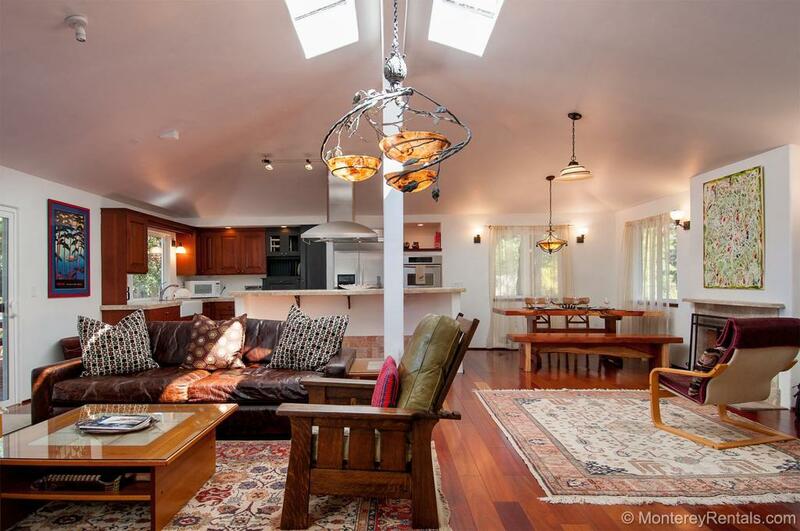 The house is perfectly situated for visiting Carmel, Monterey and Big Sur and also the Point Lobos Nature Reserve which is well worth a visit and is only one mile away from the house. Sunsets are something to behold from the house, the nearby Monastery beach and especially from Point Lobos. Would highly recommend as a place to stay and a base for visiting the area and will certainly want to come back again in the future as we all found it rather hard to leave and return home at the end of our stay. We spent three nights and loved it. Great kitchen, beautiful property with lovely peek-a-boo views and the management company was super easy to communicate with. The home was lovely, in a great location close to Point Lobos, Carmel by the Sea, and Big Sur. The mattresses were very comfortable, however all the pillows need to be replaced. They are incredibly lumpy and hard. So, bring your own if you don't want severe neck pain. The deadbolt in the front door does not lock, which needs to be repaired. However, it seemed to be a very safe neighborhood, so it wasn't too worrisome. The shower in the main bath would have been spectacular with the correct waterfall shower head, instead of the small facet like shower head there now. But the view while showering made up for it. There is a lot of construction noises very early in the morning going on close to the home. I believe someone is remodeling their home. So if you are looking to sleep in past 7 am, good luck. Even with these faults, this was a comfortable home in Carmel for the week we stayed. I would recommend it and would stay again. My husband and I stayed in August and it was our second time to stay.We love the area. It's so convenient to cook in the Lovely kitchen and have everything we need.The home is very comfortable and secluded.And everyone treated us very nicely. My family recently rented Pacific Perch through Monterey Bay Property Management and could not have been happier. The decor is casual, yet elegant, and the bedrooms are spacious and comfortable. The bathtub in the master is amazing, with forest views, and the gourmet kitchen was the exceptional. My husband, a Chef by trade, fell in love instantly. The home is located central to all of Monterey County's best attractions with easy access to PCH (Highway 1). Big Sur is just south, featuring pristine beautiful beaches, scenic hiking trails, casual eateries and a laid back California vibe. Carmel By-The-Sea is minutes from the property with quaint shops, plentiful wine tasting rooms, diverse restaurants and a fabulous beach - the historic Carmel Mission is a must see on the way. North the 17-mile drive to Monterey throughPebble Beach and Pacific Grove with amazing vistas. Monterey is the tourist center of the area, featuring its famed Aquarium, Cannery Row and Warf. Kyle at Monterey Rentals was exceptionally responsive and the rental process was a breeze. Professional and private, unlike VRBO rentals we have experienced in the past in which the owner stops by randomly. We had an amazing trip and highly recommend this rental for couples, families and fiend getaways. This is a beautiful and well appointed house - decorated and laid out with taste and imagination. It's a lovely quiet spot, but very easy access to Monterey and Big Sur, with Point Lobos right on your doorstep. Beds are comfortable, and the large double end bath is a real treat - though not good to take too many baths given the drought! Highly recommended - for young kids check out the underwater explorer sessions at MBA, and highly recommend lunch at California Market at the Hyatt 10m down the road. Also L'escargot in Carmel is a hidden gem of a restaurant. Only downside was having to pick up and drop off keys at the Monterey office, which was a little inconvenient. I was looking for rental for a 3 day weekend, someplace close to Laguna Seca, 24 minutes, that would be comfortable, convenient, great view, clean so that while my friend and I were at the track ours wives would have peaceful place to hang out and go check out the numerous parks and sites along highway 1. It is only 15 minutes to central Carmel where we had an exceptional meal at Club Jalapeno, then we cooked in for two nights in a well appointed, large kitchen where everything worked perfectly. The road up is a little twisty and narrow but not bad, but we ended up leaving the Pickup and Trailer in the Paddock at laguna since backing it in the large driveway was too difficult due to the slope, it's kind of steep with a sudden transition from the roadway. 2 car garage was nice to park our convertibles each night. About the only complaint my wife had was the master bedroom was wide open to the bathroom, no door...I was up early to get to the track and it woke her up each day. The ceiling showerhead in the soaker tub is strange, but after we got used to it is was OK, but it wastes alot of water waiting for the hot water to reach the shower head, and any change in temperature setting takes 30 seconds to be felt, so you get too hot, too cold, too hot, too cold...we finally realized don't touch the temp control once you find the sweet spot....turn it on and let it run for 3 mintues and it is Perfect, just wastes water but less then going back and forth. We heard a strange noise after using the water, there is a pressure pump to keep the water pressure high, not that loud, OK once we knew what it was. We had wine and cheese on the deck each night before dinner and enjoyed the beautiful view, no fog or clouds while we were there. It felt like a real vacation for all of us and we would love to go back, I missed all the site seeing so next time no racing, just relaxing. Everything was really excellent. The only suggestions I have is the there should be a lockable door on the master bathroom. There should be a window cover ability on the window in the master bathroom. The couch in the great room should be a sofa couch. There should be a pizza cutter in the kitchen utensils. Our stay was excellent. We definitely will come back. The Pacific Perch is a great property if you're looking to be near everything, but away from all the commotion of a tourist destination. This was our second stay and we were not disappointed. It's minutes away from local beaches, all the action in Monterey and past the traffic if you're Big Sur bound. The neighborhood is typically quiet and the house has everything you need to enjoy your stay and relax...including the great west-facing deck. We'll be back! The house and view was absolutely beautiful! Location was great and only a short drive to monterey. The soaking tub was amazing!